Virtually everything that emerged from the Durban II conference in Geneva was overwhelmed by the vile words of Mahmoud Ahmedinejad. Though some intrepid folks, like the amazing Cecilie Surasky of Muzzlewatch, tried to get the word out about everything that was going on at the conference, most of the attention remained on the issue of Israel and ignored everything else being discussed. 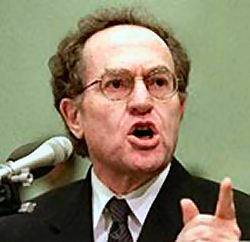 But Alan Dershowitz did his best to see to it that Ahmedinejad was not the only demagogue with a spotlight on him. Dershowitz decided to give a history lesson, purporting to “prove” that the entire Palestinian national movement, from its inception, has always aimed not for Palestinian independence and self-determination but rather at the destruction of the Jews. That Dershowitz has an audience at all is a sad comment. He has no expertise in Israeli history and politics, in the Middle East (in any discipline), or in any field related to politics. His books (yeah, I held my nose and read them) reflect this lack of knowledge and depth. But because he is well-known for other things and is rude and bombastic, he has an audience. That last is not about his views. As objectionable as I find those views, there are those who hold similar views and have done the work in their lives to merit attention when they speak. Dershowitz hasn’t, and the attention he is paid is an insult to anyone, from any part of the political/ideological spectrum, who has worked hard to attain a level of expertise. The historical issue revolves around Hajj Amin al-Husseini, the late Mufti of Jerusalem, the first major, charismat ic leader of the Palestinian movement. Some of the best background on al-Husseini can be found in Rashid Khalidi’s brilliant book, The Iron Cage. The much-anticipated Durban Review Conference gets underway next week. While a lot of people seem to have very powerful and set opinions on this event, it strikes me as one that is difficult to choose sides about. Let’s leave aside for a moment the concerns over Avigdor Lieberman’s effect on peace with the Palestinians. 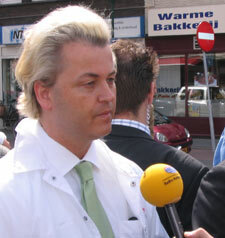 What does it say about a country when this man is appointed Foreign Minister? breaking news–these allegations had been public for many months, well before the election. This man is not only a fascist and racist, he is also a corrupt thief, and this is no secret in Israel. No doubt, apologists for Lieberman in the United States (which, shamefully, includes such Jewish leaders as Abe Foxman of the Anti-Defamation League) will say he should be regarded as innocent until proven guilty. In terms of a criminal conviction, that’s true. But politically, the accusations themselves say a lot, and, more than that, Lieberman’s dealings have been well known in Israel. Few there doubt he’s guilty, whether he’s ever convicted or not. And if we’re looking for convictions, what about the fact that Lieberman was convicted, in 2001 of assault–on a 12-year old boy. That a man like this is now in the top diplomatic cabinet post in Israel is shameful. It’s the kind of thing that one expects from petty dictatorships. Israel is often unfairly bashed. But when a man like this is their foreign minister, how much respect do they think they deserve? To be frank, Israel’s response to the testimonies of its own soldiers who served in Gaza was shameful. I have written about the bigger picture for Zeek Magazine at the Jewcy web site.